You will be presented with a simple interface to start a new sickness period. When you start a sickness period you are presented with a dialog form. 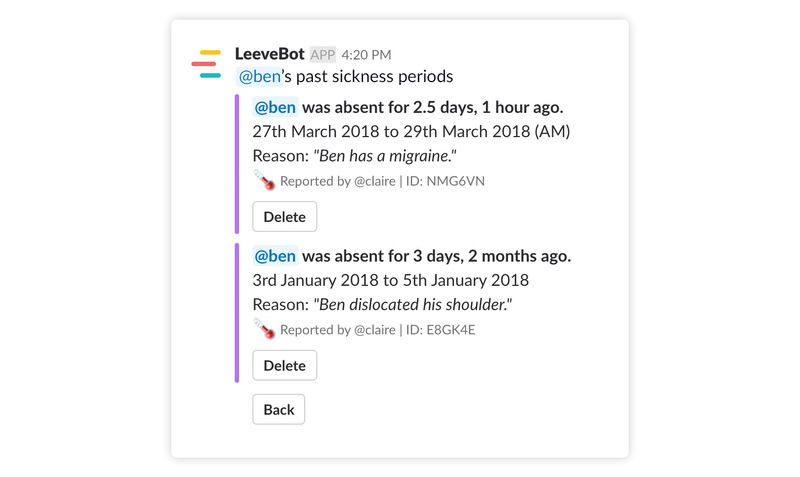 LeeveBot detects the current date and automatically sets this as the sickness start date to help you, but you can change this as needed. You can also enter a reason for your absence. Note that this will only be seen by you teams approvers. When you submit the start sickness dialog form, your team approvers will be notified of your absence. 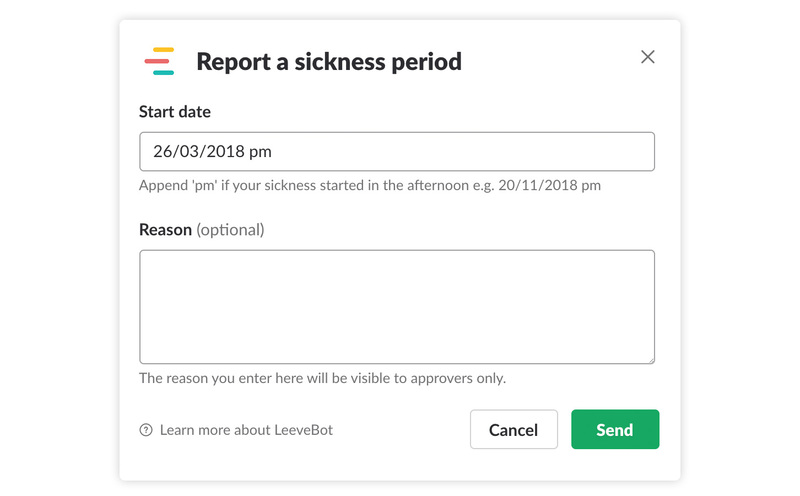 LeeveBot records sickness with a minimum of 0.5 days absence so until that time has passed you have the option to cancel your sickness period and it will not be recorded. If you cancel your sickness period, your team approvers will be notified of the cancellation. After 0.5 days absence has pass you can end a sickness period. When you end a sickness period you are presented with a dialog form. Again, LeeveBot detects the current time and automatically sets this as your return date but again you can change this as needed. When you end your sickness period, your team approvers will be notified that you have returned. As you record sickness periods the option to list your past sicknesses will become available. Past sickness is listed in date or with your most recent absence first. You will be presented with an interface to manage the sickness of the user you specified. In addition to starting a sickness period on a users behalf and listing a users past sickness you can also backdate sickness for a user. When you select this option you are presented with a dialog form. 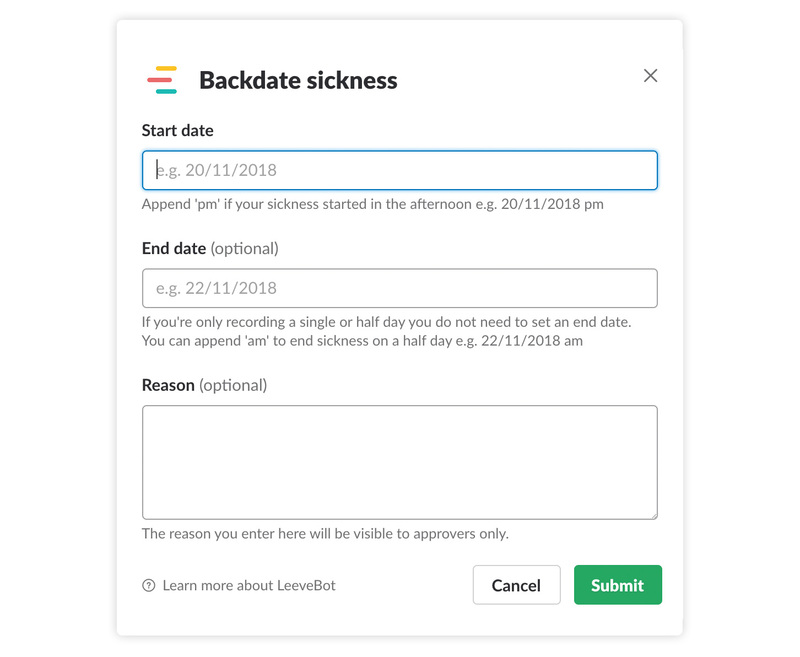 When you record a backdated sickness period, any other approvers on your team are automatically notified as is the user you&apos;re recording the sickness period for. As an approver you can also delete a sickness period when you use the list past sickness option. Each sickness period will have a Delete action associate with it.